Reliability engineering in industrial maintenance is a relatively recent function and incorporates important technological advances to contribute to the competitiveness of the industry where applied, adding value to the business. – Increase the life cycle of assets. Originating in the 1960s in the aerospace and military sectors, reliability engineering has found a fertile field where petrochemical; energy, mining, pulp and paper sectors are becoming benchmarks in establishing data analysis models to obtain the best return of installed industrial parks. The industrial internet of things – IIoT – will quickly add new technologies and methods to increase the effectiveness of reliability engineering. Reliability: The ability of an item, or a system (of assets), to perform a required function under specified conditions, over a given time interval. It’s generally expressed by the MTBF calculation. Availability: is a function of reliability and maintainability. The ability of an item to be able to perform a certain function over a specified period of time. Maintenance: is a measure of the ease and speed with which a system or equipment can be restored to its operational state after a failure. Greater maintainability implies reduced repair times, which is why it is usually expressed by the MTTR indicator, that is, the average time for repair. Risk management is an important part of the asset management process. Its purpose is to understand the cause, likelihood and consequences of adverse events and to make the risks associated with those events acceptable or not. 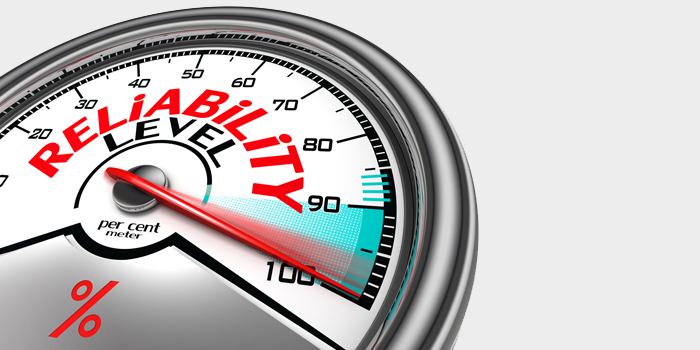 The criticality of an asset is defined by its importance (value) and vulnerability to the organization in case of failure to perform its expected function. The costs of maintenance in risk management, that is, the monitoring of the condition of the machinery and control of processes, etc., should be directly related to the probability of the failure occurring and the severity of the consequences of these failures. Condition monitoring is a systematic data collection and evaluation process to identify changes in the performance or condition of an asset system, or its components, so that proactive corrective actions can be economically planned to maintain reliability. If availability of data can be a challenge in maintenance management and its risks, from a six-month history of reliable information, it is already possible to make the calculations for sufficient application of reliability engineering. It’s recommended to include a CMMS system as the purpose of a CMMS system are organizing, automating and simplifying the maintenance operations. – Vibration analysis: one of the oldest methods of prediction in the industry that allows detection of potential failures such as imbalance, misalignment, shaft warping, wear on gears and bearings, poor fixation of the machine or internal components, abrasion, gaps, bearings, electrical problems, among others. – Oil analysis: used to detect wear on moving parts in machinery and the presence of contaminating substances. There are four types of oil analysis: physical-chemical analysis; contamination analysis; spectrometry and ferrography. – Ferrography: The quantification and analysis of the morphology of the wear particles found in lubricant samples determines, among others, the types of wear, the contaminants, and the performance of the lubricant. – Thermography: non-destructive technique for the measurement of temperature and observation of the heat distribution from infrared radiation. It seeks to identify faults in electrical equipment and systems, static and dynamic mechanical equipment. – Ultrasound: method by which internal discontinuities are detected by the propagation of sound waves through a component of machinery. – Statistical analysis of daily time series of temperature and acceleration: the use of data loggers with temperature and acceleration sensors allows knowing the behavioral signature of a machine, identifying its tendency to health or failure. While the spectral analysis generates a high resolution photograph, the temporal series statistical analysis generates a low resolution film, which, due to its wealth of data, allows the creation of a true machine record.